Since its founding in Weipa, Queensland, almost 15 years ago, mining-industry contractor Goodline has grown nationally and gained the trust of Australia’s largest miners and LNG producers. From humble beginnings, where Managing Director John Kennedy created the vision servicing Rio Tinto’s (then Camalco) bauxite mine 24 hours a day – which remains a large part of the business – to completing numerous contracts in Western Australia for iron ore producers BHP Billiton and Fortescue Metals Group, involving all manner of engineering work on their mine sites and transport infrastructures. Goodline’s largest and longest-running project, facilitating the ramping up of Fortescue Metals Groups’ (ASX: FMG) production rate to 155 million tonnes per annum, reached completion earlier this year. The company won its first contract relating to the T155 expansion in 2010 and completed its last in March 2014. Over a period of almost four years, Goodline built accommodation, offices, processing plants, train and ship loading facilities, rail lines, stockyard conveyors and more for Fortescue’s Pilbara operations. Even after the final handover, says Goodline General Manager Dwayne Finch, the company has been supporting Fortescue as it works to sustain its larger operation. Dwayne joined Goodline about seven years ago when the company was working on Fortescue’s initial T45 expansion, and recalls how it had to become more innovative by bringing a together large-scale stockyard facility with the commencement of T155. “T155 was a challenging and exciting project for us – partly because it was the first pre-assembly work we got involved in, where we’d build the modules down in Perth and barge them up to Port Hedland,” says Dwayne. Goodline took on a very large scope of work for T155, including everything from upgrading the Hamilton Motel Accommodation Village in South Hedland, to constructing the train unloader tippler cells, transfer and sampling stations, conveyors and stockyard machines for both mine and port facilities. “We had a lot of work going on in many different disciplines, with very good people throughout the whole expansion,” Dwayne adds. 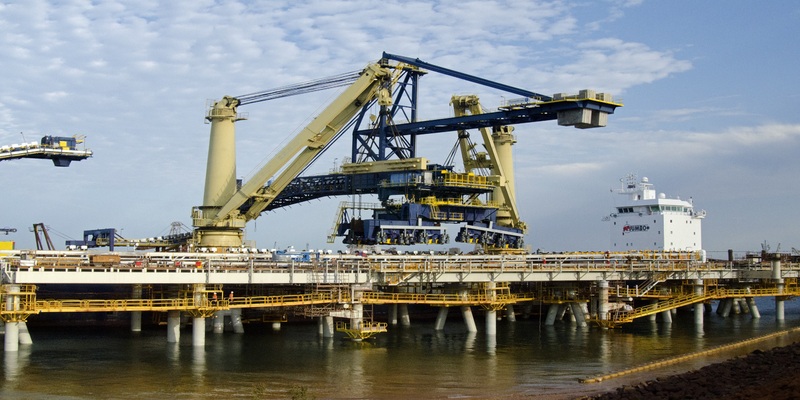 Mere months after the completion of T155, Goodline is working on another Fortescue expansion. This one concerns the land-based construction work for the AP5 berth expansion at Port Hedland and is due for completion in March 2015. Maintaining a strong relationship with Fortescue has paid off for Goodline in spades, keeping new work coming its way on a consistent basis. Goodline has similarly long-term relationships with BHP, Rio Tinto and other large Australian companies and these have supported Goodline through tough economic periods where other mining-sector contractors have seen their work and incomes dry up. Dwayne attributes Goodline’s success in securing repeat business with industry leaders to its well-established culture of safety, efficiency and transparency. “We have a good core group of people and when we commit to a job, we will be there to completion,” he remarks. Another significant contract Goodline completed this year concerned the McArthur River mine in Australia’s Northern Territory, one of the largest zinc, lead and silver mines in the world. GlencoreXstrata subsidiary McArthur River Mining (MRM) awarded Goodline the AU$17 million SMP Crushing Package contract, part of a $350 million mine expansion project, in November 2013. Goodline’s scope of work included installation of the mine’s primary and secondary crushing facilities, as well as a screening facility, a conveyor belt installation including 13 belt splices, three cone crushers and treatment facilities for air and water, as well as the erection of four transfer towers and 11 conveyor lines. Dwayne explains how the remote location of the mine, as well as the tight time frame, made the McArthur River project quite challenging. Unfazed, Goodline succeeded in delivering the project on time and on budget, and received great feedback from GlencoreXstrata. “We sent the same team from Fortescue T155 up there – it was run by one of our key project successors and long term employee Christian Gorham,” says Dwayne. Having built a prodigious reputation in the mining industry, Goodline’s next goal is to grow its business in the oil & gas sector. The company was awarded its first oil & gas contract in March this year by Australian energy giant Santos (ASX: STO). The $30 million contract requires Goodline to install the well pads at Santos’ GLNG Project in Fairview, Queensland, which has an overall value of US$18.5 billion. The GLNG Project will develop gas fields in the Bowen and Surat Basins, with the aim of converting coal seam natural gas (CSG) to liquefied natural gas (LNG) for export to global markets. The scope of Goodline’s work on the project is broad, covering the civil, structural, mechanical, piping, electrical and instrumentation (SMPE&I) work on 77 wells over an area of 1,600 square kilometres, as well as tasks including the installation of underground electrical and fibre optics, the testing of the Separator Vessel and the alignment, fitting, welding and testing of the piping. Dwayne says that the project has gone well so far, and that Goodline is pleased to be progressing in this new direction. In terms of the skills required, moving into the LNG sector hasn’t presented Goodline with any great challenge. “The Santos project has required more pipe welding work than we’re used to, but besides that all the work has been very familiar – we sent two key people, Sam Cook and Rob Buck, to ensure success,” Dwayne remarks. Goodline will continue to focus on growing its LNG business over the next 12 months, with one of its divisions operating out of Darwin, whose market it is also keen to target. Throughout that time the company also aims to progress further in building better internal reporting systems for its customers, tighten up its overheads and make its operations less administrative and more efficient. Business in the Australian mining industry as a whole is beginning to slow down, he adds, as many major mines reach the end of their lives. “The industry is more competitive now, which is why it’s so important that we continue to perform and deliver smart businesses opportunities to our customers,” he remarks.